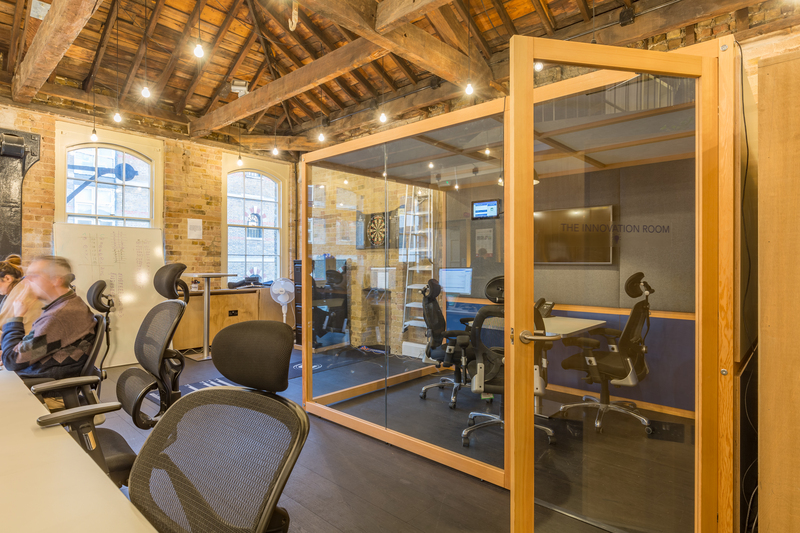 Acoustic Hub becomes an ‘Innovation Room’ – the perfect acoustic space for thrashing out ideas! Towards the end of 2016, MyDrive, a dynamic, London based business specialising in monitoring software, were struggling for meeting space. As a rapidly expanding company, fast becoming a global leader in data analytics, they soon found their office space lacked the flexibility and agility their growing team required. Being based on the top floor of a restored Victorian leather factory does provide a stunning backdrop, but isn’t always ideal when acoustics are involved! The combination of high ceilings and exposed brick walls were creating excess reverberation, compromising the ability to hold the informal meeting sessions that continue to increase as the MyDrive team grows. Provide 1 Hub – the Cabin (3m x 2m) – to work acoustically within a double height office conversion. Create an area within a large multi-functional space to provide acoustic privacy and confidentiality. Achieve a balanced aesthetic that works together with both the industrial structure and contemporary office furniture. An acoustically superior meeting room where designers can collaborate in small groups, undistracted by the sounds of the larger office. an improved reverberation time within the ‘Innovation Room’ of 0.4 seconds – a huge improvement on the reverberation time of 2-3 seconds in the larger office. Seamless integration of a widescreen video conference facility within the neat acoustic panels.